MANILA -- Russian Ambassador to the Philippines Igor Khovaev on Thursday said there is a "tremendous" progress in establishing solid Philippine-Russian ties since President Rodrigo R. Duterte assumed office in mid-2016. "A new chapter was opened in the history of our bilateral relations due to a new policy pursued by His Excellency President Duterte. I'd like to emphasize that I strongly believe that Russia and the Philippines deserve to be reliable partners and close friends, objectively speaking," said Ambassador Khovaev in an interview with the Presidential Communications Operations Office (PCOO) Global Media Affairs. Khovaev, who hosted his first ever media soiree in his Makati City residence, said both countries have no contradictions nor political disputes and negatives issues. Khovaev said the current relationship between the Philippines and Russia is "very positive" in a favorable environment that further improved diplomatic and economic ties. Both Russia and the Philippines share common problems like terrorism, transnational crimes, drug trafficking, and sea piracy, They are looking at formalizing cooperation involving a wide range of sectors particularly in defense, cybersecurity, trade, agriculture, tourism, and energy. "We did a lot to build a new and solid legal basis on the cooperation of all different tracks and different fields. Everything should be done on a legal basis. During the last two years, our two countries concluded more documents on bilateral cooperation in different fields than the previous 40 years. It's really tremendous, substantial progress," he said. 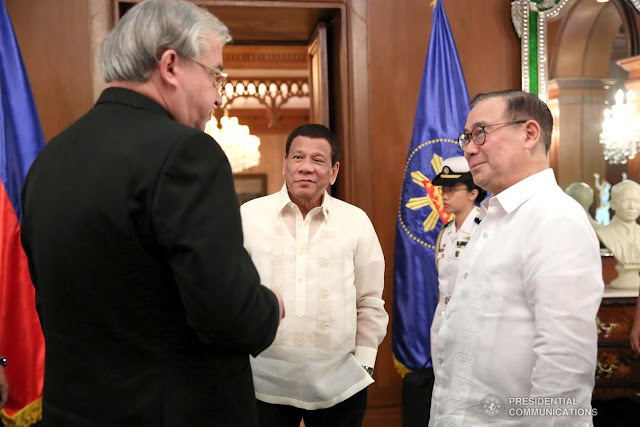 He added that there are "very promising projects," especially on the military and security sectors, that are under consideration and hoped to be signed during Russian President Vladimir Putin's planned first official visit to the Philippines upon the invitation of President Duterte. It is his dream, he said, to welcome the Russian head of state in his first visit to the Philippines. He also called on the media to do away with negative reporting that are not based on hard facts. "As a guy who grew up in the former Soviet Union, in a closed society, I know what propaganda is. Unfortunately, the quality of foreign mass media from a professional point of view, is much lower, too much propaganda, too many fake news, too many rumors, and gossips, and very very few are facts,” he said. Khovaev also dismissed reports tagging the Philippines as one of the most dangerous countries in the world. Meanwhile, Russian Press Attache Natalia Yu thanked the PCOO Office of the Global Media Affairs for organizing the event, which was attended by more than 20 local and foreign journalists. "On behalf of the Russian Embassy [in] the Philippines, I'd like to express my sincere gratitude to PCOO Global Media [Affairs] for helping and assisting us to arrange the first-ever media night tonight. We were deeply impressed by the support,” Linovitskaya said.